As a mom of three, I have experienced a taste of what it is like to have the power and responsibility of this honor. It is the hardest job in the world, but those babies have me wrapped around their fingers and watching them grow up and helping to shape them is my greatest joy. Photographing a mother with her babies is my greatest passion. It is an honor to be chosen by Beauty Revived, a national organization whose goal is honor real beauty, to celebrate a very special mom in the New River Valley. Do You Know a Beautiful Mother? 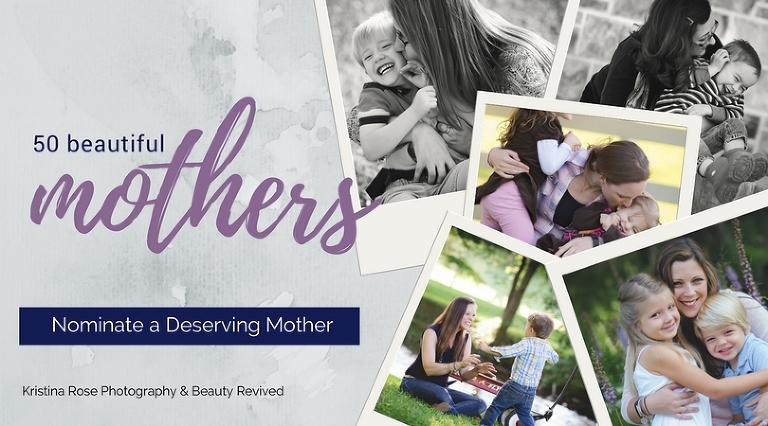 As part of Beauty Revived, a photography movement, I am asking for nominations for beautiful mothers in the New River Valley area to be featured in a national magazine. We are looking for true beauty…for a mother who deserves to be honored and pampered. We are looking for a mother with bravery, countenance, honor, leadership, or silent guidance to do what needs to be done no matter the hardship. We are looking for a mother who has that special kind of love to give. Not the kind of beauty measured by waist size or flare for fashion. The winner will be given a free photo session with Kristina Rose Photography, complete with hair and make-up, and a brand new outfit from Hey Helen Boutique in Floyd, VA. And even better, her story will be given a feature in the Mother’s Day issue of Beauty Revived magazine and on their website. I will be accepting nominations from March 18th until March 22nd and will then choose one amazing and deserving mom to receive a photo session. The mother chosen will be an example of real beauty, and will have shown her beauty by her service to others and to our community, by her kindness, and by her strength in the face of adversity. Please note: THE PHOTO-SHOOT WILL BE HELD WITHIN TWO WEEKS. The chosen mama (and her kids if she wants them photographed as well) will be required to sign a model release in order to be featured. Nominations are closed. Thanks to all those who entered. The winner will be announced on Friday, March 23rd. If you know a woman whose story deserves to be shared, please complete the nomination form.